The Chicago Cubs are, from the sound of it, very stingy bosses. 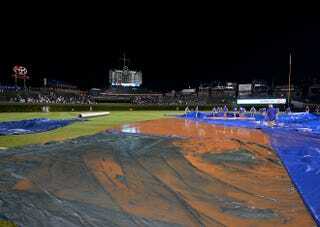 The Chicago Sun-Times reported today that the reason the Cubs struggled to get their tarp out during the rain-soaked game against the San Francisco Giants was because of cuts to the grounds crew's hours. The reason for the cuts, the report said, was so the Cubs could avoid giving out work benefits. The staffing issues that hamstrung the grounds crew Tuesday during a mad dash with the tarp under a sudden rainstorm were created in part by a wide-ranging reorganization last winter of game-day personnel, job descriptions and work limits designed to keep the seasonal workers—including much of the grounds crew—under 130 hours per month, according to numerous sources with direct knowledge. That's the full-time worker definition under "Obamacare," which requires employer-provided healthcare benefits for "big businesses" such as a major league team. In case you forgot just how embarrassing it was, here's the video of the comical attempts to deploy the tarp. The musical choice—the Benny Hill theme— is perfect. Three "high-ranking officials from other organizations" told the Sun-Times that they thought the Cubs' crew looked understaffed, and the report goes on to say that 10 crew members were sent home early that day. A team spokesman said it was because the weather forecast looked good. But "sources say this year's protocol has changed dramatically since the off-season shakeup with game-day personnel in anticipation of the ACA taking effect—along with the experience level in many areas because of resulting attrition." So now you can add the Cubs to the growing list of employers finding sneaky ways to avoid treating their employees like people. The Giants went on to successfully protest the game's results, giving them the first protest upheld since 1986. Update: A team spokesman denied that they were understaffed to ESPN and said Obamacare didn't play a role. But Vince Pesha, the director of the Sports and Entertainment division of SEIU Local 1, which includes the grounds crew, said "there's definitely been hours cut. I wouldn't say it has anything to do with [health care]. More with economics."